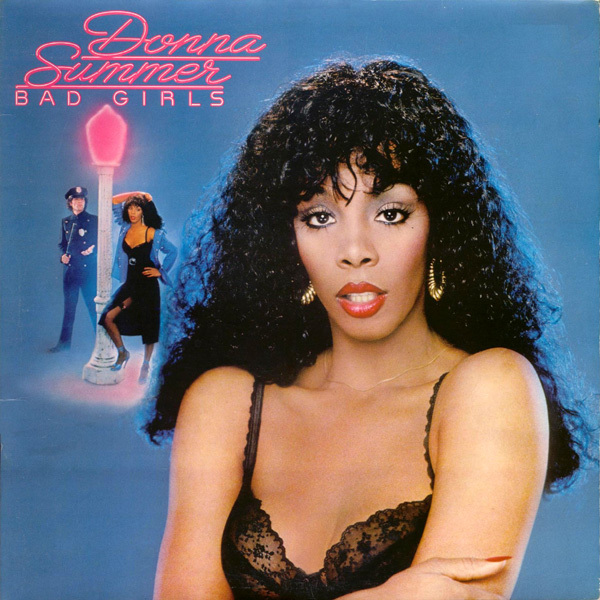 Donna Summer's 1979 disco classic 'Bad Girls' was supposedly inspired after one of Donna's assistants was stopped by a police officer who thought she was a prostitute. How such a mistake could have been made is unknown, however the cover of the single shows Donna leaning against a lamp-post in typical 1970s disco garb. Presumably the police officer in question had never been to a discotheque of the time and was unfamiliar with the idea that just because a woman is wearing stockings, high heels and a skirt that is split up to the thigh does not imply that she is a prostitute but just a regular 'girl about town'. Of course the title of Ms Summer's song is 'Bad Girls'. Note the emphasis on the plural. Yet, on the cover there is only the one girl - Ms Summer herself - in the picture. As previously stated, the fact that the clothes she is wearing are typical of the time does not really do the title justice. In this updated version, the police officer has gone and in his place are two very bad girls, in fact they are so naughty that they are standing by Ms Summer's lamp-post but, it would seem, naked other than some high heels and a hat. It is now pretty certain that if the police officer were to see them, his supposition that they were prostitutes would be much more accurate and in any case, being naked in a public place would surely call for their arrest regardless.